Archives.com is proud to present a new Expert Series article, written by Roberta "Bobbi" King. 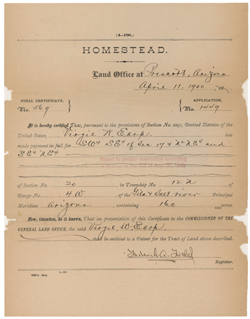 The article entitled "Homestead Records: A Glimpse Into Your Ancestor's Past" is a must read. Roberta writes and speaks regularly about homestead records, and pours her considerable knowledge about the topic into this well written piece. Homestead records document the life of pioneers, who came west searching for the opportunity to cultivate their own land. King provides a historical overview of the topic, explains why they're relevant to your research, and reveals where you can find them. After reading this article you will know more about homesteaders, and will be on your way to tracking down your own homesteading ancestors.